Amid the hustle and bustle of the city, it’s easy to lose touch with the natural world and the changing seasons. 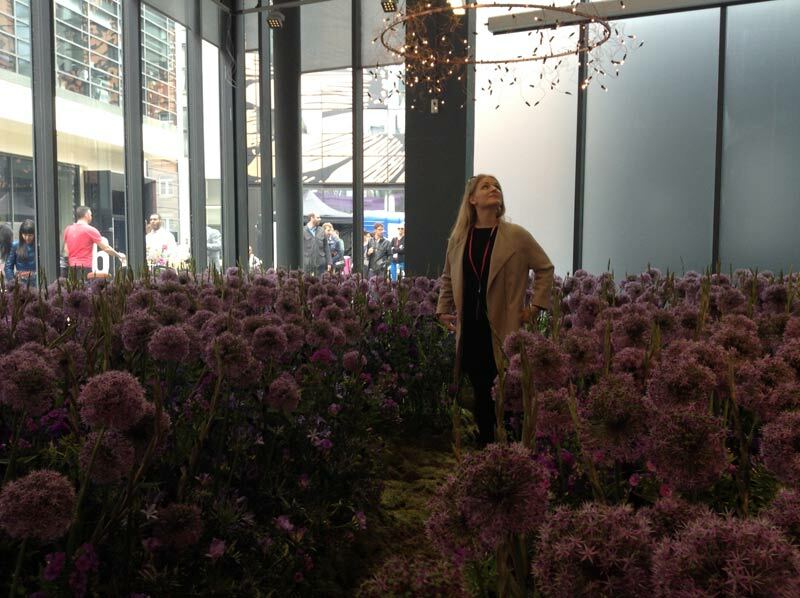 This stunning installation celebrated spring and gave the team a moment of quiet reflection amid these brilliant purple blooms. Studio Egret West is a multidisciplinary practice that showcases designers from various creative backgrounds so the team expected great things here, but they didn’t expect this oasis of calm. This year saw the tragic loss of a design visionary. As a testament to her talent the team chose two pieces from her Seamless Collection. The collection is an exploration of the relationship between curvilinear geometries and ergonomic research; in short, it examines design, movement and space. 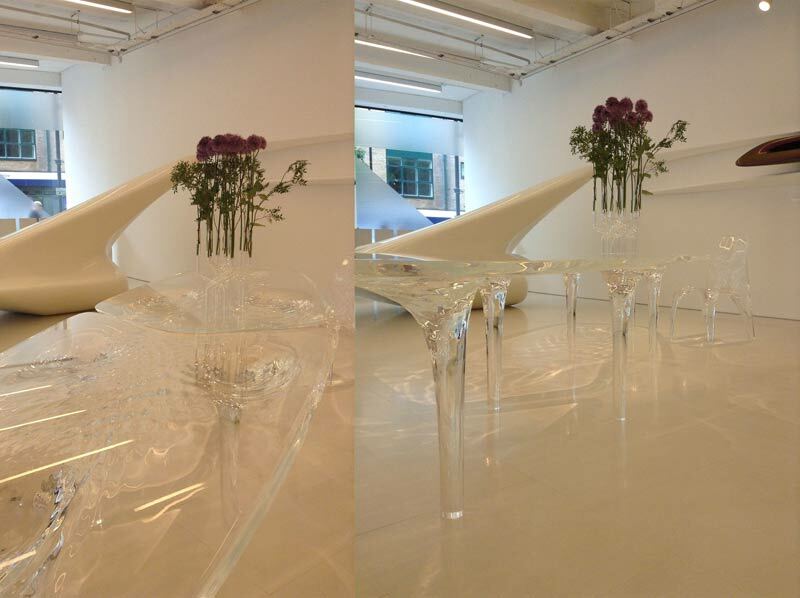 The Liquid Glacier Table’s transparency highlights the fragility of design while the light flowing through it reflects its ripples and textures. The team said it felt like floating water that could lose form and splash to the floor as they walked around it. What is clever about these lamps is how the rigid geometrical structure looks so fluid. The various sizes and shapes mean that those who have fallen in love with them can use them in small or large spaces. They embrace every angle of light through various times of day and look simply stunning. This is design at its best and exactly why the team regularly attends design events to get inspiration. What happens when art meets interior design? The team couldn’t wait to find out and they weren’t disappointed. A gallery space filled with three-dimensional renderings of Dali’s surrealist works was like seeing lucid dreams brought to life. The designers were filled with questions: how practical and strong are these pieces? How can we incorporate these elements of playful fantasy into the interior design schemes that ani M creates? 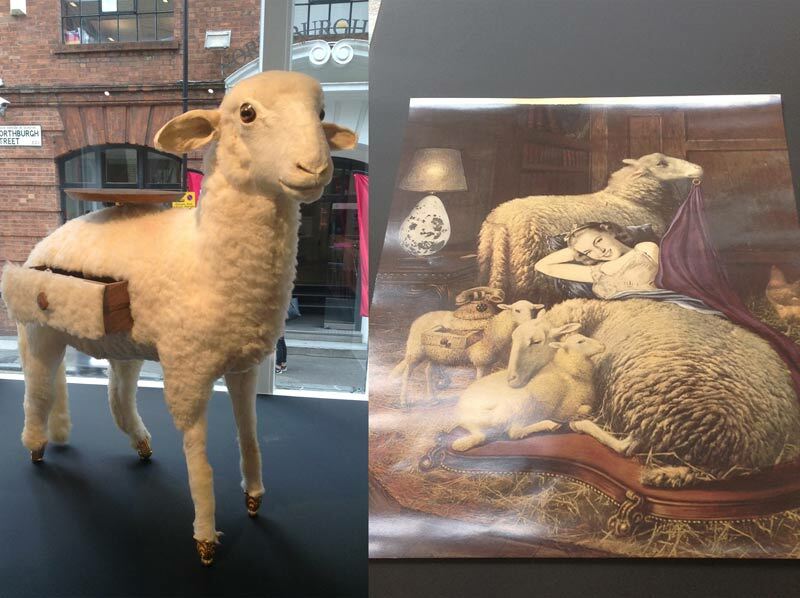 It was a joyous and unexpected twist in the Clerkenwell Design Week experience. 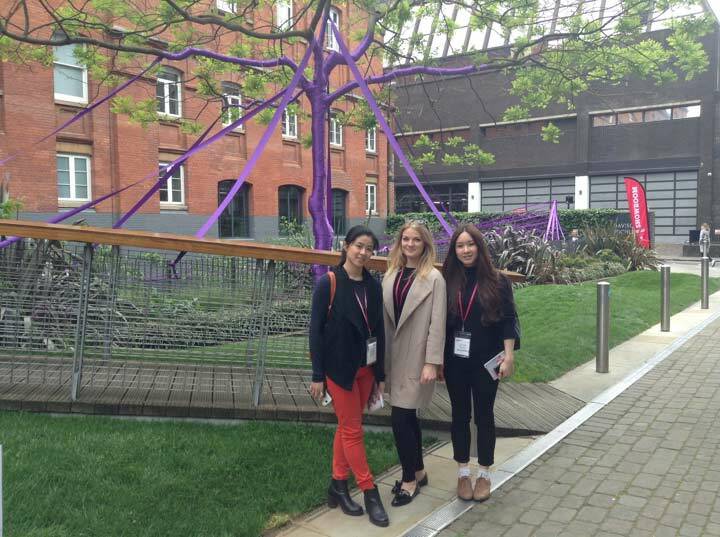 In March this year, the ani M design team visited London Design Week to be greeted by the Amazon and Tribal summer trends. 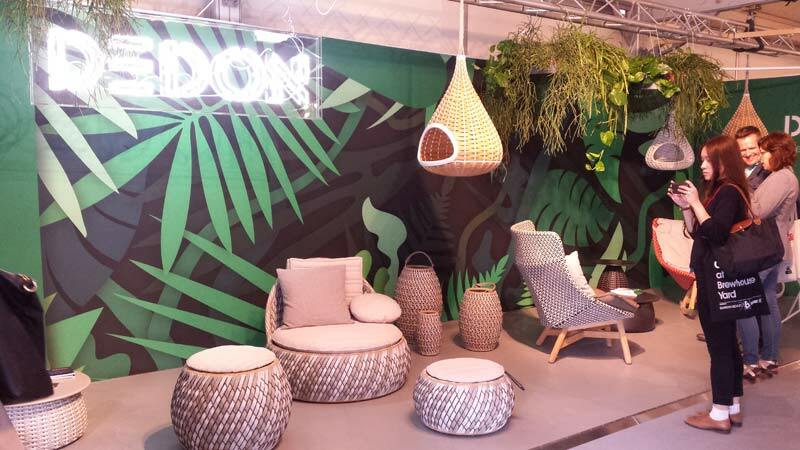 DEDON’s wicker wonderland perfectly captures the essence of these trends combined with verdant leaf prints and lush rainforest plants to create a feeling of serenity and space in even the smallest outdoor area. Imagine reclining in the hand-woven furniture, produced by traditional methods, sipping a cool drink on a hot summer’s day. 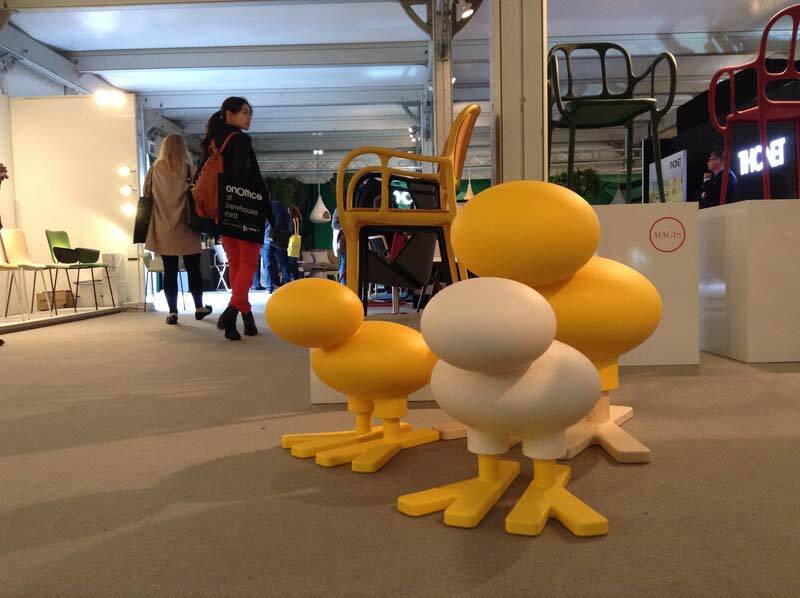 With the release of Angry Birds the movie this summer, the team couldn’t resist these playful sculptures from Magis’ children’s collection. Tactile and quirky, these sculptures bring an element of sheer joy to the design of a children’s bedroom or playroom. That’s not to say that adults can’t enjoy them too. 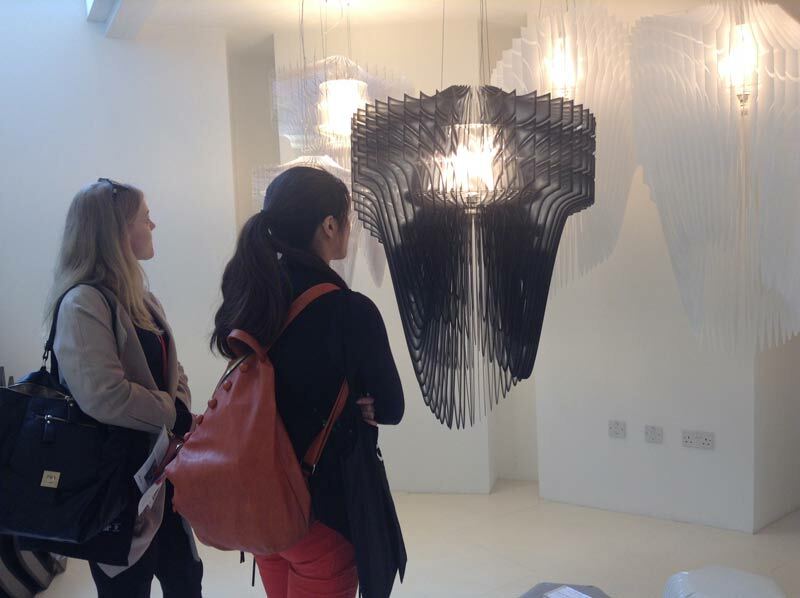 The team left Clerkenwell Design Week buzzing with ideas. If you would like to see how they can realise these pieces into a stunning interior for your home then get in contact today.